Will The NHL Mandate Visors Before Someone Loses An Eye And A Career? 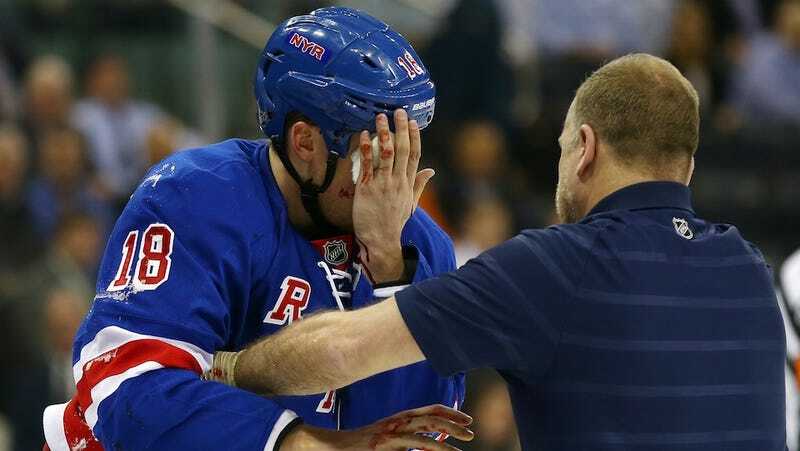 There's been no update on Rangers defenseman Marc Staal, who left the game after taking a deflected puck in the eye. He did not go to the hospital, which is great news. (The puck appears to have struck just above the soft tissue, in the brow or orbit. It was only a matter of chance and of millimeters if his actual eye was spared damage.) Staal went down like a stone, blood spotting the ice around him, the Flyers signaling for medical staff to hurry over. It was a gruesome and scary scene, and a familiar one. As of the beginning of last season, an NHLPA poll showed 68 percent of NHLers wore protective visors. That was up from 58 percent just a year prior, and from 29 percent in 2001. Eye protection is eventually going to be universal with or without the NHL mandating them, as every other level of pro hockey has done. But we have this debate every few years (most recently when Chris Pronger nearly had his eyeball scooped out by a stick), so we'll once again point out that without a rule change, it's mathematically impossible that a visorless NHL player won't lose an eye someday. Bryan Berard, a first overall pick, was still reaching his potential in 2000 when as a 23-year-old Leaf he was hit by the follow-through on a Marian Hossa slap shot. You can watch the video, and it looks every bit like Staal last night. The instant reaction, the blood. The stick slashed through the white of Berard's eye, and he suffered a torn and detached retina. Doctors were sure he'd lose his vision. His father was sure his hockey days were done. "He was living his dream. And now, I think this might be the end of his career. We've got our fingers crossed. But it looks like the end." Berard did eventually return, two years later, wearing a special contact lens that increased the vision in his right eye to 20/400—still only half as acute as the standard for legal blindness. The league didn't budge on mandatory eye protection—the concept of player safety was in a relative infancy, and Craig MacTavish had been skating around without a helmet as recently as 1997. But the fact that the number of visors more than doubled in the decade since Berard's debilitating injury shows that individual players were shaken. An entire league can be scared straight, too. In the AHL, it took two ended careers seven years apart. Jeff Libby, an Islanders prospect with one game of NHL experience, physically lost his right eye after it was injured by a skate in a 1999 game. In 2006, Jordan Smith, a promising 21-year-old defenseman in the Ducks system, was hit in the left eye with a deflected puck—just like Staal. He would undergo surgery, and never play professional hockey again after permanently losing vision, and eventually, the eye itself. Joffrey Lupul, who had played with Smith coming up, heard about Smith's injury and immediately asked the Ducks trainer to make him a visor. "I think it's going to be mandatory soon anyway. Before, I always said it's a player's choice, but maybe we have to make it mandatory. After the AHL made visors mandatory, Bill Daly said he was "hopeful that we will have our own mandatory visor rule in the not-too-distant future." The union raises the issues with its players about twice a year. So it'll happen. The only questions are when, and whether it will take another ended career to push through.